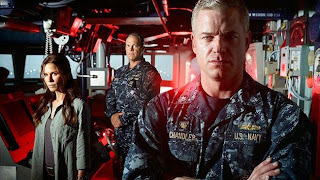 We're a few weeks late, but we finally watched the pilot of The Last Ship last night (some spoilers for the pilot ahead). The premise is that a naval warship has been sent on a long-duration, radio-silent training mission to the far north, and is also carrying two research scientists who are ostensibly studying arctic birds. When the "training" is extended, coincidentally right after the lead scientist demands more time for her research and they're attacked by Russian helicopters, the captain in turn demands an explanation.